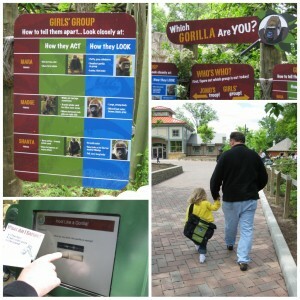 I have to hand it to the Cincinnati Zoo – there is always something new! Our family goes to the Zoo nearly every weekend these days. The great thing about the family membership is you can pop in there, check on your favorite animals and bug out whenever. 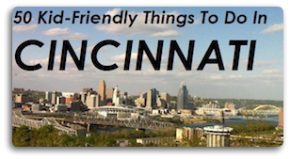 It is definitely our top pick for what to do in Cincinnati this time of year. When we were there a couple weeks ago, I saw signs for their new WILD PACKS and I was eager to check them out. I dragged Doug We braved the Mother’s Day fanfare (the Zoo had over 9000 guests that day!) on Sunday. The Wild Packs are a brand new piece of the Wild Research program at the Zoo (you might have noticed the Wild Research stations throughout the Park). The Pack is a “mobile investigation station” – consisting of awesome explorer bags (P immediately took on the role as HEAD (read: bossy) explorer – just like Dora. Dora makes Doug’s eye twitch a bit, but she’s three and Dora is a goddess – whaddayagonnado?). I will say that this program is probably best suited for kids a little older than P, but she had a ball doing what she could and Doug and I learned stuff we never knew about our mammal relatives. It is a super way to make your next Zoo trip an interactive one and it gets the whole family involved. 1) You need to go to the Harold C. Schott Education Center reception desk to check one out. 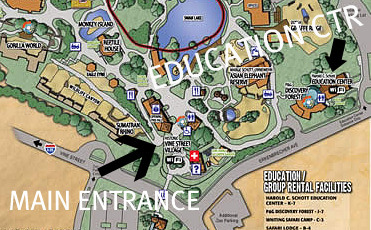 When entering the Zoo from the main entrance, you turn right towards the elephants, follow that road around and the Education Center will be on your right. If you see the giraffes, YOU’VE GONE TOO FAR! 2) It only costs $5 for each pack rental and they are family-oriented, so you only need one for your gang. You will need to leave a driver’s license as security. 3) You can take your time as you explore – the packs do not have a time limit, you just need to have it back before the Zoo closes for the night. 4) There are three pack varieties: GORILLA (they one we did) and INSECT (we’ll be back to try that one out soon) or opt for a COMBO pack of these two for a full day of fun! 5) Once you are finished, simply return to the Education Center, check in all of your items and get your driver’s license back. School groups are also welcome to make this part of their Zoo visits. Keep us posted if you try one out – we’d love to know what you thought! Tune in later this week when we highlight the Summer Education Programs and Summer Camps the Zoo has to offer! PS: Did you know your family can follow the CHEETAHS on Twitter? the internet. Here are a few tips to prevent basketball injuries. to correct problems that might have occurred due to a misshapen nose, such as breathing. I must say, as substantially as I enjoyed reading what you had to say, I couldnt help but lose interest after a while. Its as if you had a fantastic grasp on the topic matter, but you forgot to include your readers. Perhaps you should think about this from far more than one angle. Or maybe you shouldnt generalise so considerably. Its better if you think about what others may have to say instead of just going for a gut reaction to the topic. Think about adjusting your very own thought process and giving others who may read this the benefit of the doubt. I had no idea about the Wild Packs. My boys would love that! Thanks Amy. 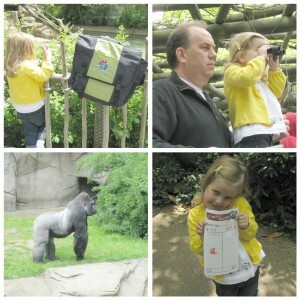 We love the zoo too – thanks for the great info. We’ll definitely have to get a Wild Pack the next time we visit. Great way to see the zoo in a new way. Can’t wait to try the gorilla pack. .-= Kristin´s last blog ..Summerfair 2010 is coming soon….We have two tickets to give away! =-.